You can create a basic site easily enough by slapping a few modules together. Or you can build a money-­making, data-­collecting, business­-sky-rocketing, game­changing MACHINE by using the right combination of modules that give you exactly the results you’re looking for ­­ no more, no less. If you’re ready to BURST through the competition, we’re here to help. If you’ve used Data Springs modules before, you know how easy they are to install and use. 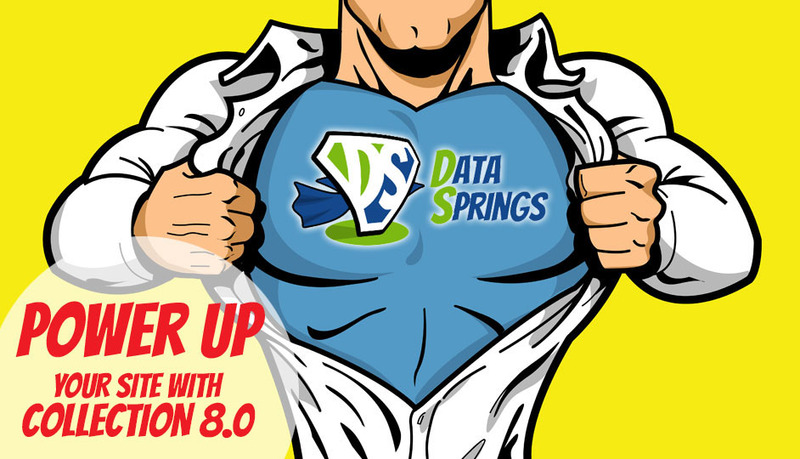 We have built each individual module in our collection with integration in mind, so when you opt for Collection 9.0 you’ll be able to install our entire toolbox quickly and start putting it to work for your business today.Yes, in the blink of an eye you will arrive on the scene like a Superhero! Data Springs has long been recognized as a leader in the DotNetNuke (DNN) community through hard work, integrity, and commitment. We’ve helped thousands of people POWER UP their website and our Collection 9.0 will do the same for you. You deserve more than just an average website. You deserve a MACHINE! Get started with Collection 9.0 today.